North American Sprinters have had a factory 4WD option since 2015. It isn’t a go-anywhere do-anything transmission like a Unimog, but it’s surprisingly good considering the van is a long, tall brick that really isn’t designed for offroading. Factory-built 4×4 Sprinters are still quite rare in the USA. Apparently less than 2000 were imported in 2015. More have been imported in 2016, but there is still high demand for them. Because there aren’t so many around, there appear to be lots of weird (wrong) stories about what the 4×4 system is and is not. If you want to go rock crawling in Moab, a Sprinter probably isn’t going to be your vehicle of choice. While it may be possible to set one up for that kind of adventure, it isn’t built with that job in mind. Instead, the 4×4 system on Sprinter vans is supposed to provide more traction on regular roads during inclement weather, and on dirt roads and sand. Sprinters in different parts of the world have various four wheel drive options. In the USA, we have a version that provides power 35% to the front wheels, 65% to the rear. 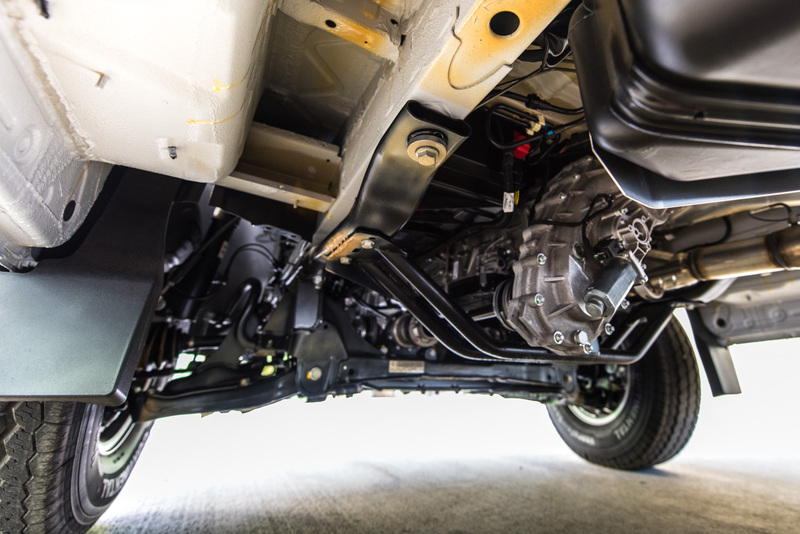 The 4WD van is 4.3″ higher in the front and 3.1″ higher in the rear, but it doesn’t actually gain much ground clearance because of the way the 4WD transfer case is bolted on to the rear of the transmission and the addition of the front differential. You do however gain some entry and exit angle for obstacles, and lower your risk of high centering (grounding the middle of the van). Because the van rides high, it’s also pretty easy to put larger diameter tires on the wheels to gain an extra inch or so of ground clearance. That extra height makes it slightly harder to step up in to the vehicle. Driver and passenger grab handles are standard in the doors with the 4×4 package. We added one at the sliding door too, and added an electric step on the passenger side. The 4×4 Sprinter is louder on the road than its 2WD counterpart, whether you have the 4WD engaged or not. The transfer case and front differential seem to add noise. It’s OK to drive at highway speeds with 4WD engaged. Fuel consumption doesn’t vary much from 2WD mode, as far as we can tell. Some people have reported transmission issues with the 4×4 model. Some vans clunk when changing gear – especially in to reverse. Others report resonance/droning at around 2100 RPM. This appears to be caused by the angles of the drivetrain universal joints not being correct, or by the rear suspension leaf springs sympathetically vibrating. Dealerships appear to have a “fix” for these issues. We had droning until we added weight to the van with our conversion. Now that it rides lower, the drivetrain angles appear to have evened themselves up! We have occasional clunking when shifting in to reverse. The first surprise for most people (and a minor inconvenience) is that the van has to be stopped before you can engage or disengage the 4×4 system. It’s not a true on-the-fly system. Most of the time though, that shouldn’t make much difference. Because you can drive at highway speeds with it engaged, and because fuel economy doesn’t seem to suffer much when the van is in 4WD, you can get set up before you hit the area where you are likely to need the 4WD. There is a lot of superstition about how to engage the 4WD. Dealers seem to be as clueless as everyone else, probably because they never read manuals either. To engage/disengage: press the [4WD] button. -- The indicator lamp in the button flashes. The ESP and ASR indicator lamps light up in the instrument cluster. ESP and ASR are deactivated for the duration of the engaging/ disengaging process. -- If the engaging/disengaging process is successful, the ESP and ASR indicator lamps in the instrument cluster go out and ESP and ASR are reactivated. -- If the indicator lamp in the [4WD] button is lit, all-wheel drive is engaged. -- On vehicles with steering-wheel buttons, the display then shows the following message: Four-wheel drive active. If the engaging/disengaging process fails, the indicator lamp in the [4WD] button flashes three times briefly. One of the gear change conditions was not fulfilled. We tend to come to a stop, put the handbrake on, foot off the brake pedal, move the gear shift to Neutral, push the 4WD button, and shift back to Drive. Often it’ll still engage with the brake pedal depressed, or if you push the button before you shift to Neutral and back again. In this picture, the 4×4 button is top left, the low range button is to its right. 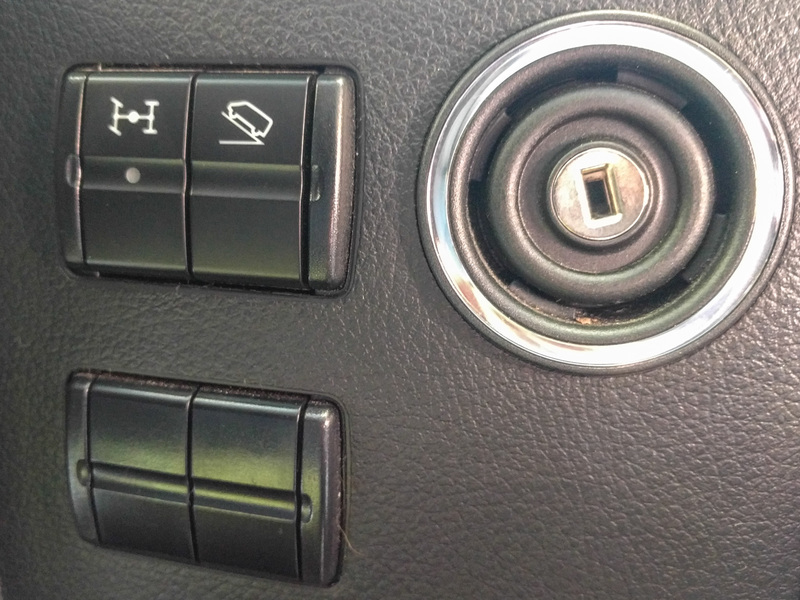 Although it’s an additional option, most 4×4 vans come with the low range button too. This adds a 40% gear reduction, which provides higher revs at lower speeds, giving more torque to the wheels. To engage or disengage, press the Low Range button. The "Low Range" indicator lamp flashes in the instrument cluster for the duration of the engaging/ disengaging process. -- and LOW RANGE is engaged, the "Low Range" indicator lamp lights up. -- and LOW RANGE is disengaged, the "Low Range" indicator lamp goes out. Sprinters come with ASR (Acceleration Skid Control). It’s a form of traction control and most of the time it helps you out. However, sometimes you are going to need one wheel to slip in order for the others to do their job. 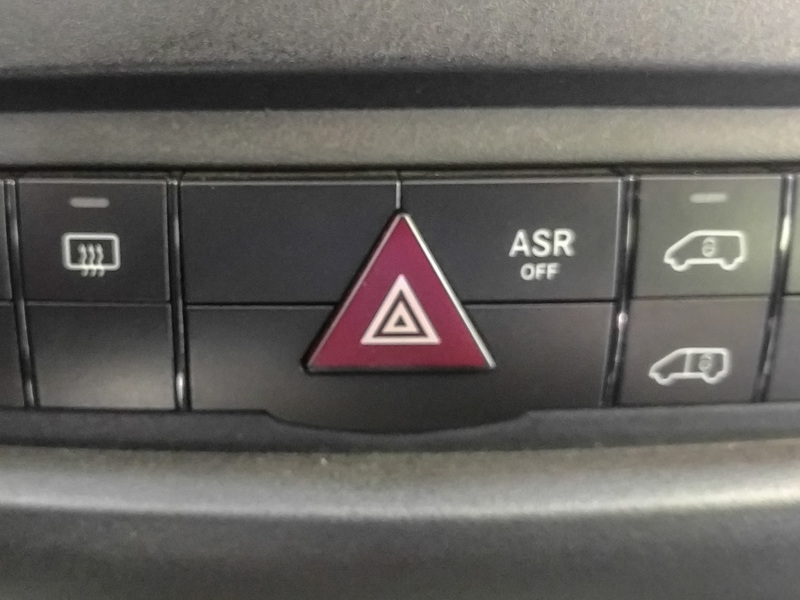 There’s a button on the center console area to switch ASR off. Tire choice and airing down your tires can make a big difference to traction as well. We aren’t experts on that topic, but there’s lots of debate about it on the Sprinter forum. Feel free to dive in over there! The 5-speed Sprinter transmission seems to have a mind of its own. That means it’s not always going to select the gear you want to use when you are driving on more challenging surfaces. You can manually shift the transmission by knocking the lever to the left or right while you are in Drive. We’ve found that the Sprinter needs relatively high revs to encourage it to clear some sections of trail. It also has a disconcerting habit of refusing to give you those revs if it’s got slowed down – you can push the pedal down but it doesn’t respond. Until it does. Then you jump forward faster than you wanted. Maybe we’re doing something wrong, but we’ve not had that problem in other automatic transmission 4x4s in the past. That means we end up taking some sections faster than we’d like, just to ensure it doesn’t get too hung up. We’ve lived with the Sprinter’s version of four wheel drive for over a year now. Overall we’ve been really happy with the 4×4. 2WD Sprinters seem to be pretty capable animals, but the added peace of mind of 4WD on icy/snowy freeways and on dubious forest roads has made us more confident in driving and exploring. We aren’t trying to scale rock ledges or ford 3 foot deep rivers, so for us the system works well. A high roof 170″ wheelbase vehicle really isn’t designed for that type of gnarly behavior anyway. We’ve traveled to places we otherwise wouldn’t have gone, and that has made the system completely worthwhile for us. Update: Check out this video by CampoVans to really understand how the 4×4 system works. At various points you’ll see an off-the-ground wheel spin, then stop. That’s the brake system applying to just the spinning wheel, so the other wheel maintains traction. Also note that the van will back the power off (ASR) without the driver changing their foot position on the accelerator. That’s a little unnerving sometimes. I read on the forums that the 4WD disengages at a certain speed. Is this correct? That’s not true at all. 4WD stays engaged all the time, even if you turn the engine off, until you next disengage it. Think about it: the 4WD system has to be engaged/disengaged while you are stationary. How could it then magically switch off at speed? I thought it was a little fishy when I read it too. Just was a little unsure as I read the post on the Sprinter Source forum from a pretty reputable member. I think what Sailquick is saying in that post is that he drove at high speed in 2WD mode (i.e. with the 4ETS disengaged) rather than that it disengaged while he was driving at high speed. His point is that even in 2WD mode there was noise from the 4WD part of the system (the transfer case). As Sailquick mentions, the transmission is noisier than the 2WD version even when the 4WD is not engaged. The rear wheel drive must go through the transfer case at all times and that adds extra mechanical interactions and thus more noise. Great write up. Thanks. True the dealers don’t understand it. They told me that it was ok to run the 4×4 so long as the road had some slip to it i.e. gravel, sandy, snowy. But I understand that it is just fine to run it on dry pavement if you want to set up before the bad conditions set in. 4×4 trucks were getting stuck last weekend in 25 cm of snow but my sprinter did just fine. Thanks Tim. One of the reasons I keep adding content to this site is because the dealers typically don’t spend the time learning about the product they are selling. The information exists, in the vehicle manual and in brochures, but most dealers don’t seem to want to spend time actually learning anything. This is a fantastic site. Thank you for the detailed write up. Keep it up. Such useful information. Thanks Michael! Glad you find it useful. good stuff keep it coming! drove through a foot of snow this A.M here to get to a client’s, the front end made a serious “knocking sound” when I was reversing to turn around…very un-nerving like it was going to snap an axle or something. Also even with the ASR turned off I had to really floor it to keep the truck moving….I certainly will not try and climb any hills in deep snow. Forget it! Weird – that’s what you might expect from a locking differential if you were turning sharply, but that’s not how the Sprinter works. Was it perhaps the brake coming on on one wheel to stop it from spinning? Agreed – especially with the stock tires and not so much weight in the back, the wheels can break loose pretty easily. In two wheel drive with snowys my van does better than 4wd no snowies. with snowies in 4wd I am very satisfied. But turning the steering wheel stalls progress, like any vehicle. Its all about good tires! Kinny, the European and Pacific Sprinters are very different systems to the North American version. Glad we could help you out! Marc, the 4WD video isn’t ours, so I don’t know that van well but the rack looks like a Fiamma rack. Dan, that’s right. It’s an all wheel drive system rather than a traditional four wheel drive system. It has no problems with the differentials getting wound up at highway speeds. You could leave it in 4×4 mode all the time if you wanted to. Dieselfumes, do you have any idea if the new 2019 version will still have the low range capability? Apparently they are switching to a seven speed automatic transmission, so it sounds like they are revamping the entire drive train. Thanks in advance — your posts on this system have been very helpful. Scott, I’ve read online that there will be a low range option. The new 3-liter V6 engine does get a 7-speed transmission. That should be a major advantage over the relatively clunky 5-speed box. At 190 Hp and 324 lb-ft torque the new engine is incredibly similar in specifications to the current version. It’s not clear whether you’ll be able to get the 4×4 with the gasoline engine, or whether that engine will even be available in the USA. The marketing literature also says that 4WD can be engaged at low speeds. Currently you have to be stopped for it to work successfully. Great info on this feed, thank you. I have one question about the Sprinter, how does it handle when driving on beach sand? Linda, we’ve not done much driving on beaches but the few times we have, it’s been fine. To be honest, on firm sand you’d be fine in two wheel drive mode. Other folks reading this might have different experiences. We’ve had more trouble on waterlogged grass/mud than on sand. I think that’s more because the stock Continental tires don’t have great grip in that sort of situation. A while back on the Sprinter forum there were a couple of posts where people were almost intentionally trying to get themselves stuck on the beach. If you try driving in wind-blown sand dunes with really fine dry sand I’m sure you could get bogged down. Regular beach driving shouldn’t be an issue though.